Catch up with the conversation we had during a multidisciplinary tweetchat with the We Communities, exploring evidence for everyday – how practitioners find and use it, and how it impacts their practice. At Cochrane UK, we use social media to share evidence, most often from Cochrane reviews, in different formats and at different levels of complexity, with the aim of making it accessible and useful to people making health decisions. We do this through our blogs, blogshots and other products across several social media platforms, and through tweetchats, most often with the wonderful We Communities! @WeNurses allowed us to co-host their first chat of the year, to explore how those in clinical practice find and use evidence, and what they see as some of the challenges. 76 people came together for a lively discussion, a thoroughly multi-disciplinary mix that included healthcare students and clinical librarians, addressing a number of questions. What was the last piece of evidence used to inform your practice? I was really interested to see what people would answer here. Different types and sources of evidence were mentioned, including Guidelines, toolkits, some evidence on logic models’ and evaluation to inform a research design, a trial and – (relief!) Cochrane reviews! How easy is it to find and understand up-to-date evidence? It was agreed that it’s not always easy to know what you’re looking for, or to know what you don’t know! It can be difficult to identify what is important, and what’s reliable, from the mass of information you have to sift through. Sticking to reputable sources was advised (did I mention Cochrane?! ), but it can be a daunting task, especially for students. There can be confusion not just about sources but about different types of evidence, from audit, service evaluation, quality improvement evidence and so on. Time constraints are a common obstacle. It was good to be reminded that librarians can be an enormous help, offering time and expertise where we lack them, in the hunt for evidence. One person quipped, “Go to Google to find 100000 facts- go to a librarian for the right fact”! Librarians can help you improve your critical appraisal skills, and so too can good resources, such as the Critical Appraisal Skills Programme (CASP) tools and checklists. Along with some chat about the difficulties, there was also a reminder that evidence can be empowering, and give you confidence in your practice. I’m sure many people were nodding at their screens at the comment that how evidence is presented has a huge impact on how easy it is to find and use. @hannahlames1 has been working on visual abstracts and shared an example; I hope we’ll be hearing more from Hannah about this excellent work in a future blog for the Health And Research Through Social Media project website. A full open source primer on making these visual abstracts was shared by @AndreMIbrahim. 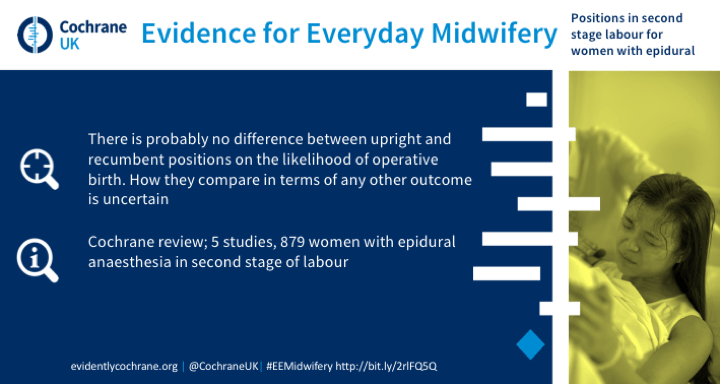 I mentioned our blogshots, which share brief information from Cochrane reviews, like the example below. You can find them all, and download (and share) them, here on Tumblr. @LizAllibone made the point that it’s important to differentiate what is sound evidence and what is probably best practice but not evidence based. An understanding of where there are evidence gaps is crucial! What are the barriers to making practice evidence-based? ‘People’, was an immediate suggestion here, and the “we’ve always done it this way” attitude that I well remember encountering. There can be considerable resistance to change, and clinicians need to become comfortable with challenging the status quo. There may be challenges from other disciplines too, while financial obstacles and getting ‘buy in’ were also mentioned. Of course, obstacles to finding and understanding evidence are also obstacles to getting evidence into practice. Paywalls preventing access to research papers were mentioned here too, and the problem many hospices have of accessing Athens accounts. What can help bring evidence into practice? Learning together can help – including through journal clubs and linking case study review forums with current evidence. Organisations should have learning and development policies that support healthcare professionals to be evidence-based practitioners. ‘Keeping it real’, was another suggestion; evidence needs to be practice-focused and relevant. Accessing evidence through blogs with reflections from patients and practitioners alongside it, as we do on Evidently Cochrane, can help you keep up with the latest research, to know where there is continuing uncertainty, and to reflect on the implications for you practice. Time was a factor mentioned here too, with the need for time to discuss the evidence and its implications for practice in a particular clinical setting. Evidence-based teaching in universities is crucial but apparently not always demonstrated. It was suggested that there should be more emphasis in CPD/revalidation requirements on how you applied the evidence you learned about to your practice. Culture change! There needs to be an expectation that using evidence to inform practice is part of what practitioners do. What one piece of evidence would help with your daily practice? The wish-list included alternatives to drugs for managing chronic pain; usefulness of weight-bearing through lower limbs on a standing frame after spinal cord injury; when to seek medical help for cough; data sharing value; why we still have restricted visiting hours; and the effects of hospital lifestyle on relatively healthy patients. It was great to have clinical librarians participating in the chat and one, Cathryn James, @JamesPjcjames, said she’d love to know what you want. I’ve a feeling there are some clinical librarians who are going to be slightly busier in the wake of this chat! 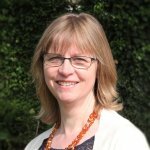 Join in the conversation on Twitter with @SarahChapman30 @CochraneUK @WeNurses #WeMDT or leave a comment on the blog. You can read full details of the tweetchat here.